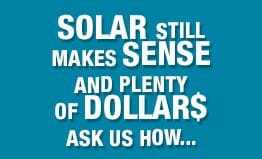 • It might be because you would rather your hard earned dollar stay in your pocket than pay the electricity bill. • It might be because you want to do your part to contribute to a sustainable environment for future generations. • Maybe you want to protect yourself from your electricity bill rising year after year after year. • It might be because you want to add significant value to your property. • Is it because you don’t want the Carbon Tax to take more money away from your family? • It might just be because your neighbours have solar and you have had enough of listening to how much money they are saving. SEE OUR CUSTOMER CARE SECTION FOR PRODUCT DOWNLOADS.